How does a long established business embrace change in order to transform its values into memorable experiences for their customers? Established in 1969, Accent have provided office furniture to businesses throughout Australia, delivering consistent quality and service. However in a market that is embracing disruption, having a product driven approach to business is not enough to fuel recognition or retain loyalty. The A lettermark is a silhouette of a front facing chair which sparks an immediate connection to Accent’s products. Its simplicity sets the stage for a visual system that predicates on minimalism and functionalism. Managing all branded content is an aesthetic system that defines how Accent communicates to its users. Inspired by Scandinavian design, the Accent identity system uses a soft colour palette contrasted with strong intentional use of typographic embellishments. The system is minimal and asymmetrical to further contrast and display important content. The system came into fruition as a way to highlight Accent's proud history, without excluding their passion for innovation. By aligning it to an iconic design style, we can effectively communicate both perceptions. 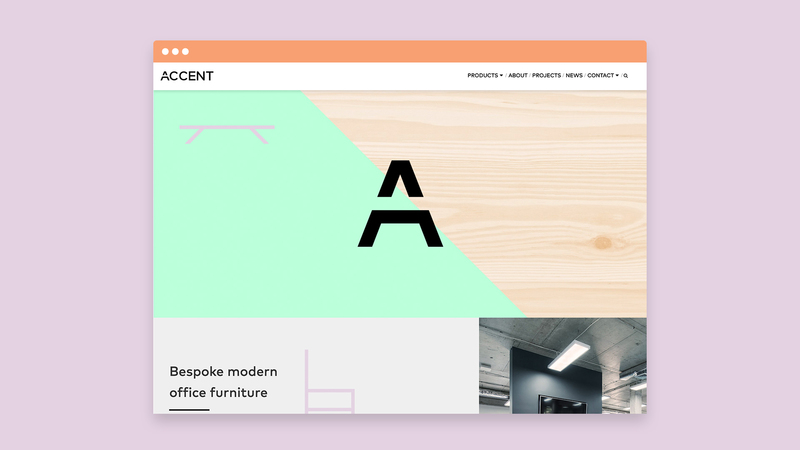 Central to the Accent brand is their website. It acts as the information centre for the business and is used heavily throughout their entire business' workflow. Looking at how their users engaged with their digital platform, we discovered more engaging and logical ways to organise Accent's vast stocklist. What resulted was a product focused experience that used simplicity to ease the headaches of navigating through complex information. We also ensured that this experience was equally considered across all device types, adding more ways in which users can engage with the brand. They just totally got it right! Since the launch of our new brand, we have received nothing but positive feedback from our clients.